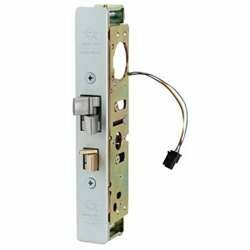 Entry via keyed mortise cylinder or access control element. Fail-secure lock, operates on 12, 16 or 24 volt DC power, and is rated for continuous duty. Supplied with flat and radius faceplates, 1-1/8" backset, anodized aluminum finish.